Boy, Oh Boy, Oh Boy did I LOVE sewing for this series. 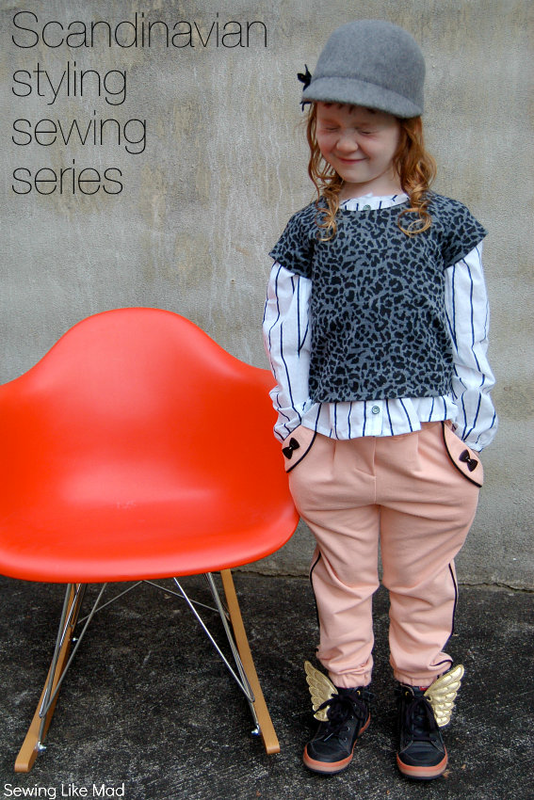 Scandinavian Styling Sewing Series that is. The lovely Stacey from the great blog Boy, Oh Boy, Oh Boy Crafts (yeah she has three boys so you know....it is quite a fitting name, haha) lived in Denmark for the last couple of years and to celebrate the influence the Scandinavian style had to her own style she made this series. I KNOW...so fun! Being a Scandinavian myself of course gave me some sort of an advantage. I did not need to do any specific research. BUT it also forced me to reflect on what part of my style was classic Scandinavian. My style has of course also been influenced by living in the US for the last 5 years. But also what is Scandinavian style specifically? 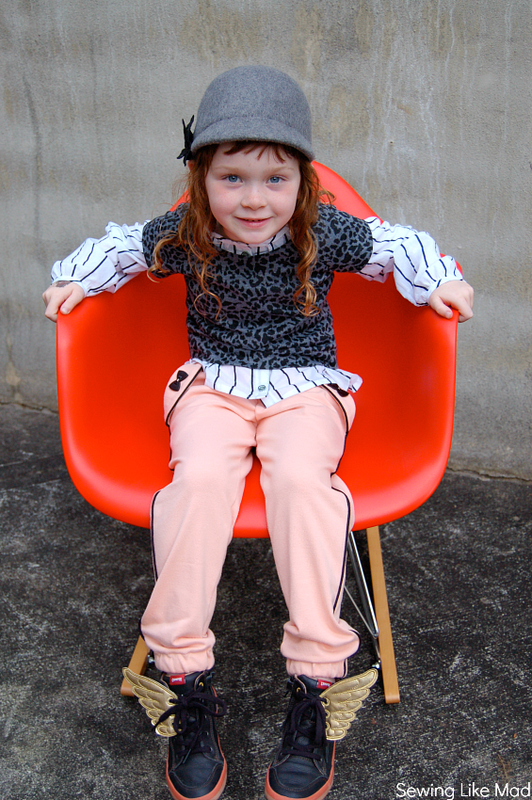 - adult style in mini versions and ALWAYS in comfortable fabrics and styles. - Prints like dots, stripes, leopard, small flowers (think Liberty fabrics), geometric prints and camouflage. A loose striped cotton shirt from a Japanese pattern book, a tight short sleeved leopard knit sweatshirt and some peach French terry pants with black piping. Both self-drafted patterns. I originally made the pants for The candy challenge at week 2 of Project Run and Play. You can see them HERE made in a soft 21 whale corduroy. I will let it up to you if you think it fits my own definition above, ha. A closer look at the short sleeved sweatshirt made from this great knit I bought at Michael Levine. Classic shape but with short sleeves. I don't have any photos just of the shirt itself but it is pretty simple. 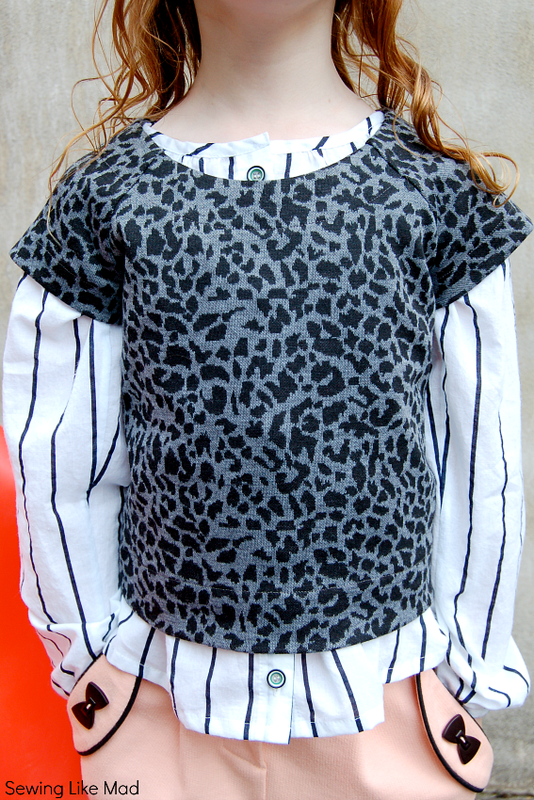 I have made a short sleeved version you can see HERE. Loose shape, raglan sleeves, a bit of gathering in the neckline and finished of with a bias tape. 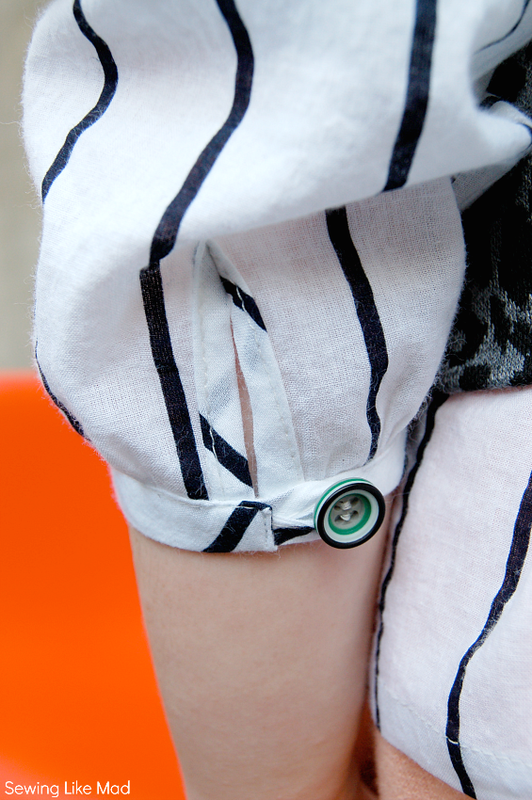 Simple front button placket. The sleeves have a slit and is also finished of with bias tape. I skipped the button hole and put a small loop in there instead. Amazing black/white/green buttons from Lots of Buttons. Wilma was purrrring when she got these pants on. "Oh Mommy they are so comfortable." Yay! They have an elastic waist, a fake zip fly, a single front pleat, a slightly tapered leg and a wide elastic in the end of the leg not super tight to the ankle. They also have side pockets with a decorative flap that is held down with these insanely cute bow buttons from Hancock Fabrics. Thank you Stacey for inviting me! Make sure to check out all the other amazing posts in this great series. You can find and follow it all at Boy, Oh Boy, Oh Boy Crafts. Det er sådan et fedt sæt, Mie. Jeg elsker leo - og parret med en sart rosa, jamen så smelter jeg. Go Scandinavia :-). So cool, Mie! Love love the pants! I love your outfit! I can see the Scandinavian influence, and I LOVE the pants! that is awesome!!! love the piping.. i want to do that better!!! so adorable! I was hoping those pants were from a pattern because I want to make a million of them! Oh Mie, so fantastic! I agree with Alida, love those pants!!! Yes! You need to get those pants digitized and graded! I WANT THAT PATTERN. Love those pants!! Thanks for explaining more of the Scandinavian style for those of us who don't know all about it. Adorable...both outfit and model.. Those button bows are soooooo cute.. Just made that outfit..
Mie, Mie, MIE!!! ;) You are so amazing!!! This is incredible. I love it. And your daughter is just too adorable. The details have me gawking and scrolling back and forth to get every bit of it. Love it love it love it! The details are so wonderful.I love that top and those pants! Your work is always flawless. Would you believe I had those same wings for my roller skates when iwas 10? i am running out of words to describe how much i love everything you make. seriously. you amaze me every single time. great pattern matching and colors. 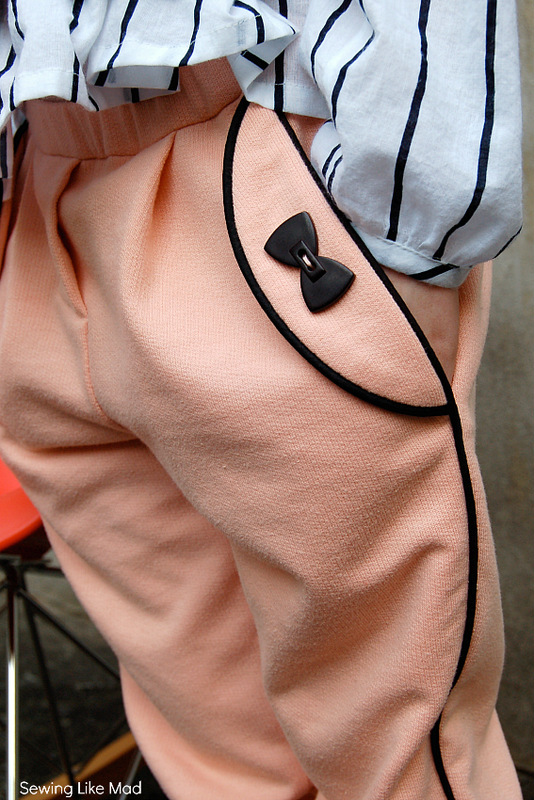 impeccable styling and sewing. i loved everything about this. wow! Those pants are too great! Gorgeous Mie!! Your daughter looks stunning and your sewing is just amazing!